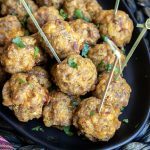 Stuffing Sausage Balls are an easy appetizer with all of the flavors of the holidays. Cheese, sausage, bacon, and stuffing are rolled together for one perfect bite! Combine sausage, cooked bacon, stuffing, and cheese in a large bowl. Mixing until thoroughly combined. Roll into balls, approximately 1 heaping tablespoon each. Place sausage balls on prepared baking sheet. Brush sausage balls with olive oil.